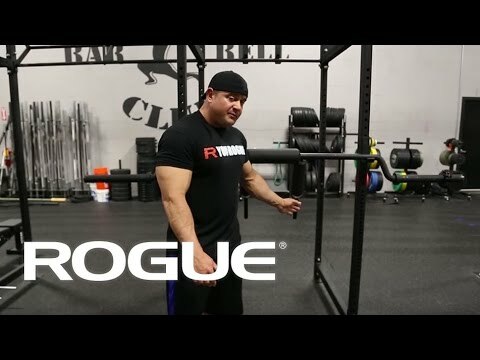 Rogue Safety Squat Bar doesn't make squatting any easier. The weight distribution is unique to this bar. 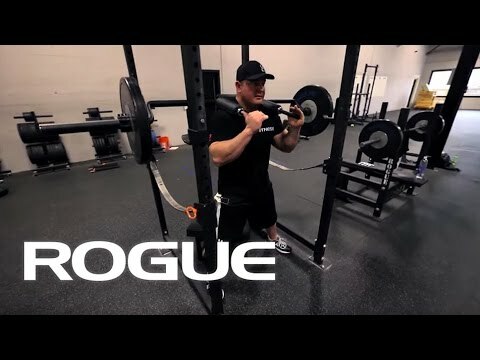 Training with the Rogue Safety Squat bar is known to tax your anterior chain; the weight distribution falls between the front squat and the high-bar back squat to vary your power output training. This bar is a safer option for intense squat progressions or maximum load lifts.This bar is known to increase your maximum working weight when compared to the traditional back squat. *Cerakote has an excellent resistance to corrosion, but metal-to-metal contact, particular on the sleeves, can still cause wear over time. SB-1 - Rogue Safety Squat Bar is rated 4.7 out of 5 by 40. Rated 5 out of 5 by Bonefixr from Safety Squat Bar I purchased the Rogue Safety Squat Bar for my home gym. It allows people to safely get under the bar despite stiff shoulders, allowing the profound benefit of the squat to those who would otherwise be unable to perform it. The quality of the bar is first class. Solid, well balanced and American Made, which are all important aspects to me. It arrived packaged securely and ready to be placed on the rack. Rogue has never disappointed me. That trend continues unchanged. I recommend this bar to anyone serious about strength training who would benefit from what this high quality, American made Safety Squat bar offers. Rated 5 out of 5 by Raptor Rick from The Squat is back Shoulder injury prevented me from low bar technique thus had stopped the squat in my routine. This Rogue product has enabled me to include the Squat again. Favorably impressed with build quality. Great product!!! Rated 5 out of 5 by Cordeg from Solid squat bar I have had a few members asking for one of these and it hasn't disappointed. More people have given me positive feedback that it is a great addition to our weight room. Rated 5 out of 5 by Caveman1976 from Excellent This thing is great. Heavy duty, solid, and safer than a regular bar. Wish I had this in my 20s and my thirties. Rated 5 out of 5 by case3307 from AWESOME SQUAT BAR!! This thing is outstanding especially for squatting after shoulder surgery. Had a labrum repair in late September due to a Highland Games injury and I still cannot get into a normal low bar squat position with a straight bar, but this has allowed me to continue squatting starting 8 weeks out from surgery!! It is incredibly heavy duty and durable as with all the gear I have purchased from Rogue. Top notch quality and construction. If you have shoulder problems and think you can't squat anymore think again. I WOULD GIVE THIS MORE STARS IF I COULD!! Rated 5 out of 5 by Caveman1976 from Excellent Massive, well made, great pads, highest quality, this is what everyone should use as a squat bar. Wish I had this in my 20s.